Last week, the Strategic Growth Council (SGC) held workshops on the Affordable Housing and Sustainable Communities (AHSC) program. The workshops were billed as a discussion of “lessons learned” during the first two rounds of funding for the program. SGC staff is working on new guidelines for the next round, which will commence some time in 2017. But if you went to one of the workshops—held the last two weeks in Merced, Oakland, and Long Beach—and expected to hear staff talk about what they had learned, you would have been disappointed. Instead, the workshops were set up to find out from participants what changes they thought the program needed to incorporate, based in experience from its first funding rounds. Attending the workshop were affordable housing developers, housing advocates, and transit planners. Many of them seemed to want answers about why specific projects failed to get AHSC funding, but they gamely engaged in discussions of the topics as laid out by staff. Three “breakout sessions” of twenty minutes each brought together small groups to discuss five topics: transportation, housing, the application process, scoring criteria, and the methodology for quantifying greenhouse gas (GHG) reductions. Staff were specifically looking for feedback on each of these topics and how processes could be improved on future application rounds. But each of the topic areas could have benefited from day-long discussions on their own. For example, in a short session it was hard to even get going on a topic as complex as whether the scoring criteria helped or hurt the state’s efforts to meet greenhouse gas reduction goals. The program’s ambitions overwhelm its size. 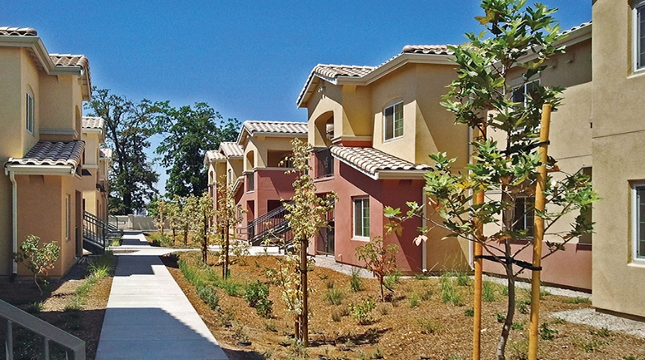 The AHSC funds affordable housing and transportation projects using funds from cap-and-trade—which means all its projects, first and foremost, have to reduce greenhouse gases. By itself that is a tall order, given current methods of estimating greenhouse gas emissions and projecting future population growth. But it’s also far from the program’s only goal. The AHSC aims to get transit planners and housing developers to sit down and work together to increase emission reductions. That needs to start with a basic educational process designed to get them to understand better how transportation and housing choices affect each other. The program also tries to make sure that historically disadvantaged communities have access to its funding. It also has the goal of encouraging high-density housing near transit, a form that has not been traditional in California and is frequently opposed by current residents who don’t understand the need for it. And it’s trying to do all of this with a small pot of funding. The AHSC gets twenty percent of the money that is collected under California’s cap-and-trade system. The last quarterly auction, in November, did a little better than the two previous ones, bringing in about $364 million–of which the AHSC will get $72 million. The total amount the AHSC will be able to award next year depends on future auction results. The program’s last round of funding, released in October, was able to fund only 25 projects, out of 85 that made it to the detailed application stage. It awarded a total of $289 million. At the workshop, staff both wanted to get into the weeds with participants and tried to stay away from detailed questions about specific projects. Are we defining “high-quality transit” correctly, they asked? What does it really mean for a project to be “shovel ready,” and how can that best be shown on paper? Are the current requirements for showing that other funds are committed the best way to do that, or are the forms used relatively meaningless? Are the categories for quantifying GHG emissions the right ones? Mike Pallesen, who applied for a grant for a senior housing project in Ukiah, was discouraged about the way the scoring for GHG emissions worked. “We got no points for being a completely solar project,” he said. “If a solar project isn’t reducing GHGs, then what is?” he asked. At one table the question arose as to whether it would help if projects could get a better idea of their GHG reduction scores before going through the lengthy application process. That is complicated, said the table moderator, because the GHG scores are determined on a curve, with each project ultimately rated against the other projects being considered. That may be one of the biggest lessons learned, and one that may have to be learned over and over again. One of the program’s goals is to get housing developers and transportation planners to work together, in recognition that the only way to get people to drive less—and thus reduce greenhouse gases—is to make that possible with better, more holistic planning. But that’s not how planning happens now. Because this program is the only source of state funding for affordable housing, a developer with an ongoing project who needs funding may look for a way to tack on a transportation project. And it’s natural to try to figure out how to maximize the chances of winning funding with the least amount of extra work—and the work to complete the AHSC application is very complex. And the complexity lends itself to finding shortcuts. Several of the projects that got AHSC funding, for example, supported a local transit agency by using the funding to buy a bus. The claim is that a new bus would enable the agency to increase bus service to the new housing, but it raises the question of whether that’s the best way for the two sectors to work together. Or if it even counts as “working together.” Or if a new bus even guarantees more service, given the need to also pay for people to drive the bus. The larger question remained unasked: How can this small program encourage the kind of major shifts in thinking that would allow people all over the state to drive less, thus reducing their greenhouse gas emissions? Several comments at the workshop pointed out that, even with twice or three times the money available, even if it could fund all the projects that applied for funding, the program wouldn’t make a dent in the need for affordable housing in California—let alone better transportation options for people. Strategic Growth Council staff plan to release new draft program guidelines by late February or early March. The guidelines will be available for public comment, and another series of workshops will be held in various parts of the state. Look for more opportunities to participate at that point. Renewable energy is the future of a sustainable planet. The AHSC connects planning for housing and transportation, and supports building affordable housing that makes it easy for people not to drive. It's a small program with a big mandate, and one of the few sources of state money for affordable housing. Here's a look at new draft guidelines for applicants.